Port Hardy Fire Rescue, a volunteer Fire Department, was established in July of 1968 and a second Fire Hall was added in 1976. Today, Department volunteers cover a fire district that encompasses over 26 square kilometres. For road rescue coverage, firefighters travel to Holberg on the Holberg Road, the Hwy 30 cut off on Hwy 19 and mile marker 15 on Hwy 30. Annually, the Department responds to approximately 150-170 calls. The Department has mutual aid agreements with Coal Harbour, Port McNeill, Port Alice, Coastal Fire District, Port Hardy Airport, Kwakiutl (Fort Rupert) Reserve and Gwa’sala-‘Nakwaxda’xw (Tsulquate) Reserve. Fire Halls #1 & 2 boast the latest firefighting and rescue equipment, and provide regular training sessions for volunteers. 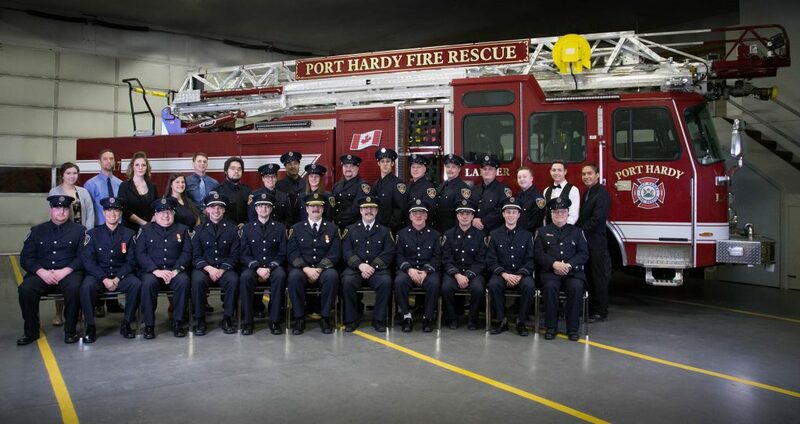 The District of Port Hardy budgets approximately $217,000 per year for the Port Hardy Volunteer Fire Department. The Department is volunteer only, and endeavours to have a full roster of 32 members, which includes Fire Chief Chief Brent Borg. Practice nights are every Thursday at 7:00 p.m. at either Fire Hall #1 (8890 Central Street) or Fire Hall #2 (4985 Beaver Harbour Road). Anyone 19 and older who would like to join can come out for a practice.